Our back office and accounting software combines traditional accounting with real estate transactions, commissions, and agent management. It also provides real-time reporting on how your agents—and your brokerage—are performing. brokerWOLF has everything you need to run a real estate business. The top real estate back office and accounting solution, brokerWOLF does it all. Everything you need to organize your agents and staff—from contact details to anniversary dates, tax documents, licensing details, and more. Goodbye, duplicate data entry. brokerWOLF pulls listing information and refreshes data every four hours—so you and your team are up to date. Track and protect the trust/escrow funds coming into your brokerage without creating a separate GL. Set and forget commission calculations. Includes customizable commission structures, fees, agent expense allocation, deal classes, and more. In one system, track and manage all of your accounts payable and receivable, and financial reporting. Financial and operational reports also included. Robust real estate reporting and business intelligence to track agent performance, operational costs, forecast, budget, and more. Our team of dedicated professionals will help you set up and implement franchise fees and reporting, all based on your unique best practices. brokerWOLF powers your entire brokerage so you can focus on making money instead of paperwork. Agents want their own transaction management tools. But that means your back office has to duplicate data entry to make up for it. So why not put them together? 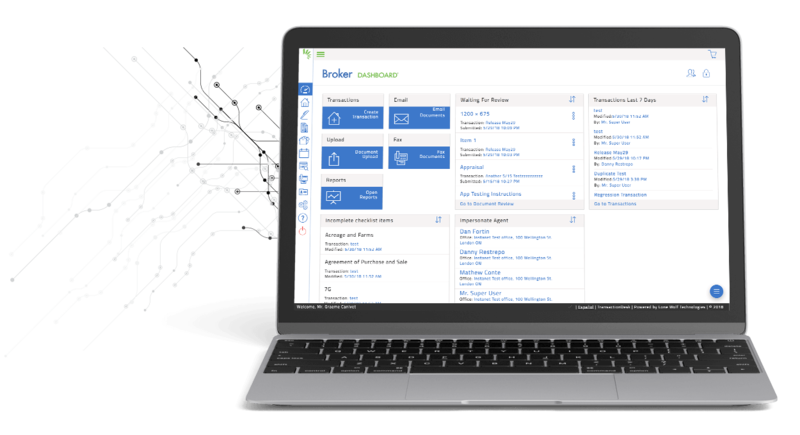 Our industry-leading transaction management solution sends deals directly to brokerWOLF—and back again—in real-time. This gives you one platform for all of your transactions, from contract to close to general ledger, so everyone is using the same information at the same time, all the time. See what brokerWOLF can do for you. From real estate-specific accounting to transaction management, listings, fees and expenses, and more—get a closer look at what brokerWOLF can do to help your brokerage. © Copyright 2019 - Lone Wolf Technologies. All Rights Reserved. At Lone Wolf, we’re all about delivering solutions that workbest for you. To make sure your enjoying the best experience, please let us know where you’re visiting from today.